SF Parent Political Action Committee kickoff! 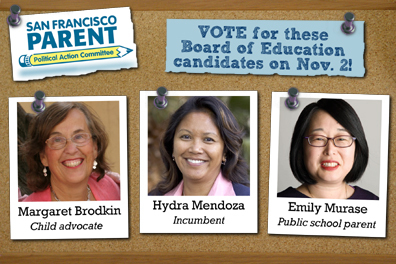 Spread the word about our endorsements to your friends, family, neighbors and associates — send an email letting them know who to vote for or even just a link to the sfparentpac.com web site or email us at sfparentpac”at”gmail.com to get a stack of postcards to mail. This grass-roots effort will be successful if everyone who cares about better schools and a more family-friendly San Francisco gets involved. Join us!